If you've read my last blog you'll know that the skill and ingenuity of some knitters is pretty impressive, but what I like best is a sense of colour and fun. 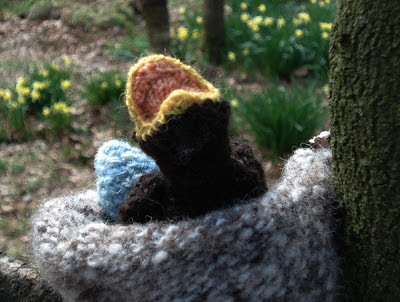 I've been looking for something to follow woolly creatures in a wood and I came across Melanie Porter. I've seen examples of her work like lampshades which I really like but what I wanted to share here is this video which I found on her Facebook page. It's really worth a look. Here are five things I liked about her and her work. 1. She's inspired by being hands on and makes the pieces herself. 2. The pieces are colourful and fun. 3. She's recycling old bits of furniture which would otherwise be unloved and discarded. 4. She was very matter of fact about what she does and thinks about both form and function. 5. She said it was 'bitter-sweet' when she had to let a piece go (so the pieces are made with love, aahh so nice!). It's great that when I looked around it didn't take me very long to find another great example of knitting that is fun, colourful and gives pleasure, thanks Melanie. Following on from my post A Walk in the Woollen Woods (part 1) this is the second part called unsurprisingly A Walk in the Woollen Woods (part 2)! If you haven't the faintest idea what's going on, and to the uniniated this could look like a woodland where some very odd genetic mutations have occurred, you can get up to speed by reading part 1; the link is at the bottom of this post. Here's my next five picks for my favourite pieces in the Woollen Woods exhibition at Acorn Bank. Dickens Owl - has the most brilliant look of surprise on her face; like that feeling you get driving down the motorway when you suddenly realise you've driven past three junctions and have no recollection of 50 miles of your journey. In her case the surprise is more like 'there I was enjoying life in that lovely warm stash box dreaming of being a lovely jumper and now here I am perched in a wood... how the Dickens did that happen!' (hence the name). Red Squirrel - top marks for thinking outside the box or should that be inside the jumper? This fantastically quirky creation is sewn together from a recycled woolly jumper and has a strangely misshapen appearance that just adds to its charm. 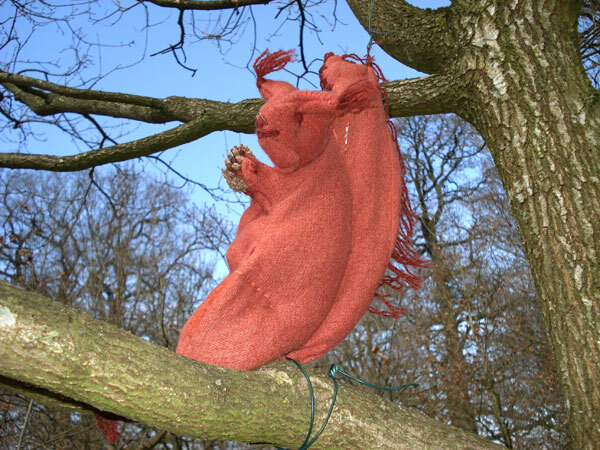 I think it looks a bit like there's a real squirrel inside a fine-knit jumper trying to find the neck hole (no I don't know where that image came from perhaps a traumatic childhood memory from learning to dress myself?). desire on the top shelf "look mummy/Dayve I've found a nest/cake". Red apples - everything up to now has been rather cute and cuddly and this one's different. I chose this as it was both unexpected and yet perfectly suited to its location (as Acorn Bank holds a great apple day event every year). 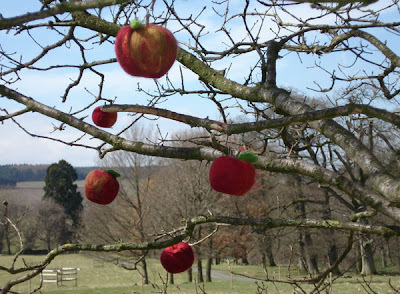 Where better then to hang a group of very real looking apples from a tree? I'm particularly looking forward to seeing this one later in the year when the trees are in leaf... I wonder if next time I see them some will have bites out of them? 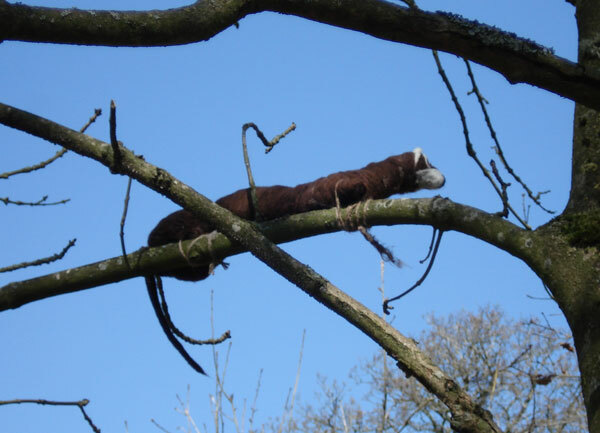 Stoat/weasel - I missed this first time around as it's been placed high in the trees and it's a lovely piece. I'm sorry Vivienne if I haven't got it's identity right...although as I recall it should be straight forward since 'a weasel is weasily recognised and a stoat is stoatally different'. 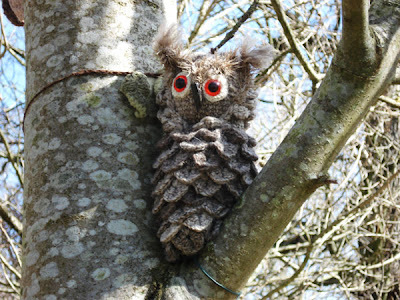 When I'm not walking in woods taking cute photos, I'm making textile art or blogging about it; here's my gallery; or follow me on Twitter for knitting and textile art news.